Q. What are challenges to being a successful company in this industry? Are there ways that being involved in USCC is helping you meet those challenges? As with any new product, it takes time to generate awareness. Some composting facilities are reluctant to accept unknown products. The USCC has been instrumental in providing networking opportunities that have led to partnerships and increased acceptance of our compostable bedding at some facilities across the country, such as WeCare Organics. Q. What are some of the features that USCC offers that you find most useful? We use the Compost Locator Map to help our customers inquire at composting facilities in their area. The educational resources, such as articles and fact sheets, are also beneficial to us and to our customers. Q. If you could sit down with a compost manufacturing company to discuss any issue, what would it be and why? A compost manufacturing company could offer valuable perspective on how to fast-track adoption of composting practices by businesses and consumers and develop the supporting infrastructure from the back end. There is no shortage of research or documentation of best practices to study, but implementation remains a challenge. Solutions require input from stakeholders at every stage of the process. In addition, we need to inspire development of new compostable products by removing barriers such as expensive testing and certification fees, which can be prohibitive to entrepreneurs. Q. What do you think is a key element to the successful future of the compostable products in the U.S.? Innovation. We need new and creative ways to make composting a more accessible and compelling option. Several high impact companies from MassChallenge are doing this. Q. Introduce your fellow USCC members to your team! What do you do to build company spirit? 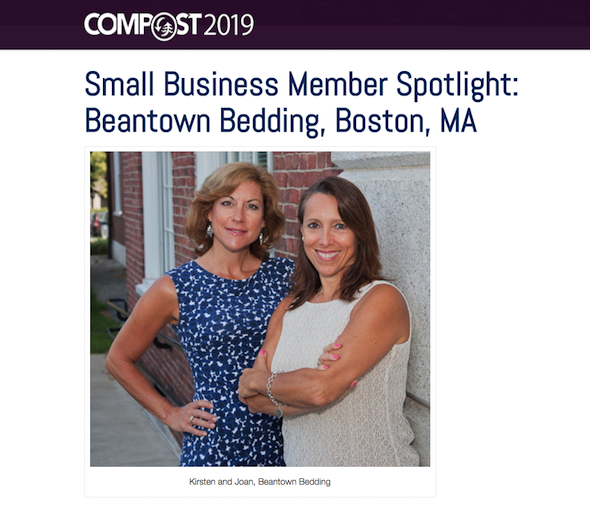 Beantown Bedding’s founders, Joan Ripple and Kirsten Lambert, are two momrepreneurs who came up with the concept of compostable bed linens when they searched for an easier way for their kids in college to have clean sheets. It turns out that their solution had broader appeal. Laundry-Free Linens® have been adopted by universities, hospitality businesses, healthcare and emergency management organizations nationwide. The company also won the bid to supply sheets for the Special Olympics World Games in Los Angeles.